The number of immigrants caught trying to enter the U.S. illegally rose 2,000 in May to more than 40,000. WASHINGTON — The number of immigrants apprehended for crossing the border illegally increased in May despite the Trump administration's "zero tolerance" policy that prosecutes illegal immigrants and separates prosecuted parents from their children, according to numbers released Wednesday by the Department of Homeland Security. 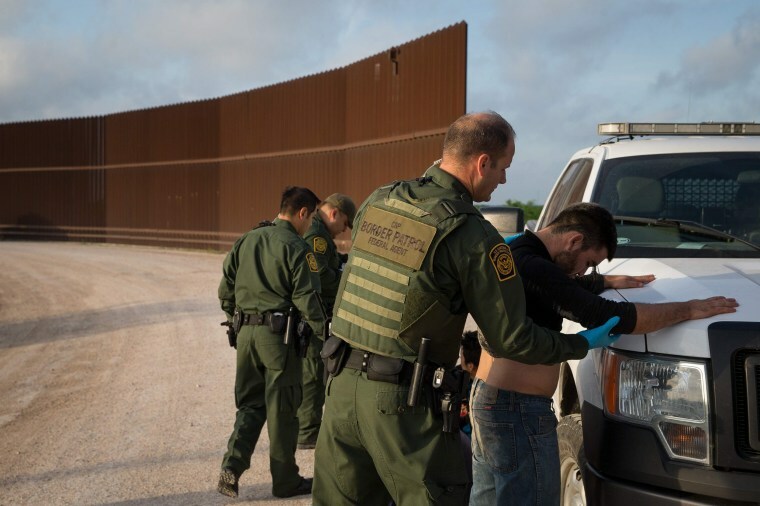 U.S. Border Patrol agents arrested around 2,000 more immigrants crossing the border between official points of entry in May compared to April, up from 38,234 to about 40,400, according U.S. Customs and Border Protection statistics. Overall, including immigrants who turned themselves in at ports of entry, more than 50,000 immigrants tried to enter the U.S. by land over the U.S.-Mexico border last month — the third straight month to surpass 50,000. A spokesperson for DHS, Tyler Q. Houlton, said the numbers show "that while the Trump administration is restoring the rule of law ... no one expects to reverse years of political action overnight or in a month. ... Smugglers, human traffickers, and nefarious actors know our loopholes well and accordingly exploit them." The numbers suggest that Trump's tough border stance is not deterring illegal immigration, said David Leopold, former president of the American Immigration Lawyers Association. Historically, immigration across the U.S. southern border increases between April and May as weather conditions improve, according to data from U.S. Customs and Border Protection. Immigrants coming from Central America typically take months to reach the United States, a Department of Homeland Security official said, so immigrants who crossed the border illegally last month likely began their journeys not knowing they would be prosecuted. Speaking to MSBNC's Hugh Hewitt on Hewitt's syndicated radio show Tuesday, Attorney General Jeff Sessions said that separating children from their parents at the border was necessary to stop the flow of parents bringing their children to the United States illegally. "What's happening is we are having more people coming bringing children with them entering between the ports of entry, between the ports of entry illegally, and they're not, you cannot give them immunity," Sessions told Hewitt when asked if it was necessary to separate parents from children when they are detained or apprehended at the border. Leopold said the poor conditions in Central America are driving immigration in a way that Trump's policies cannot stop. "I think it's desperation," Leopold said. "They think it's better to spend time in detention than face what they're facing in the Triangle," referring to the Northern Triangle countries of Guatemala, Honduras and El Salvador. Mark Krikorian, executive director at the Center for Immigration Studies, which promotes lower immigration into the United States, said the policy has not been in place long enough to have an effect. "It's like turning around an aircraft carrier. It takes a while. Changing expectations is not an easy thing to do when the prior administration followed mistaken policy for so many years," Krikorian said. Separating children from their parents has caused a backlog in border stations, where hundreds of children, some younger than 12, are being held.